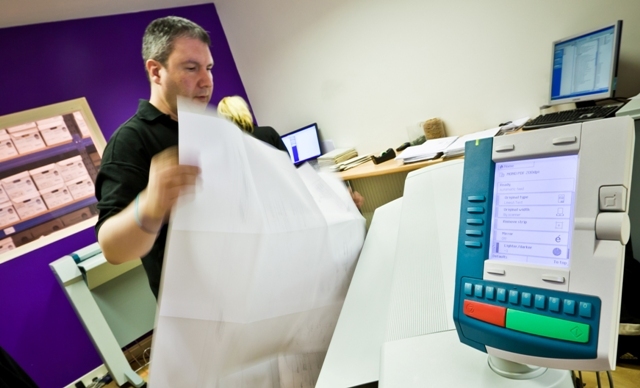 Our scanning service comes with a 200% quality checking guarantee. Clients includes blue chip companies, local authorities and utility companies. The company has OCE large format equipment in a secure document scanning bureau and can scan any size up to A0. To find out more about Cleardata's Large Format Document Scanning Services call 0800 046 8081 or visit our main website. The company will happily provide you with a consultation on your large format scanning or drawing scanning requirements. Cleardata has invested in the latest Océ Large format document scanning equipment, scanning large format documents and drawings to the highest quality. Documents are usually converted into PDF or TIFF format. Cleardata has vast experience of scanning large format documents and drawings for architectural, engineering, utilities and local authorities. Sign up for a no-obligation large format document scanning trial with Cleardata. Contact us to arrange your trial, alternatively estimate your document scanning requirements with our online scanning calculator. Have a look at our video to see our large format scanning services in action. Find out more about our large format scanning, drawing scanning and drawing scanning and document scanning services. Cleardata has invested in a new OCE CS4336 QS Large Format Scanner to increase its capacity for Large Format Scanning Services. Read more about our large format scanning investment. Emma's area includes Blyth Valley, Castle Morpeth, Gateshead, Newcastle upon Tyne, Durham, Chester-le-Street, Easington, Sunderland, North Tyneside, Hartlepool, Derwentside, Darlington, Redcar and Cleveland, South Tyneside, North Shields, Stockton-on-Tees, Teesdale, Tynedale, Northumberland, North East, Middlesbrough, Tyne and Wear, Wansbeck and Wear Valley, Aberdeenshire, Argyll and Bute, Borders, Clackmannanshire, Dumfries and Galloway, Dundee, East Ayrshire, East Dunbartonshire, East Lothian, East Renfrewshire, Scotland, Edinburgh, Falkirk, Fife, Glasgow, Highland, Inverclyde, Midlothian, Moray, North Ayrshire, North Lanarkshire, Perth and Kinross, Renfrewshire, South Ayrshire, South Lanarkshire, Stirling, West Dunbartonshire, West Lothian and Western Isles. Paul's area includes Shropshire, Barking and Dagenham, Barnet, Basildon, Bromley, Broxbourne, Braintree, Brent, Brentwood, Basingstoke and Deane, Camden, Crawley, Chelmsford, Cheltenham, Croyden, Ealing, Enfield, Epping Forest, Greenwich, Guildford, Hackney, Bath, Bexley, Gloucestershire, Haringey, Harlow, Harrow, Hart, Havering, Hillingdon, Hounslow, Kensington, Chelsea, Lewisham, Merton, Newham, Wandsworth, Watford, Westminster, Herefordshire, Brighton and Hove, Rugby, Bristol, Eastleigh, Eden, Gosport, Havant, Islington, Luton, Kingston upon Thames, Lambeth, Redbridge, Richmond upon Thames, Richmondshire, Stevenage, Sutton, Southwark, Spelthorne and Tower Hamlets. Rushmoor, Hampshire, Windsor, Maidenhead, Slough, Hertsmere, St Albans, Welwyn, Hatfield, Hertfordshire, Tam worth, Luton, Staffordshire, Cannock Chase, Oswestry, Shrewsbury, Telford, Stafford, Newcastle under Lyme, Nottingham, Coventry, Birmingham, Dudley, Leicester, Sheffield Nuneaton, Stratford on Avon, Warwickshire, Sandwell, Birmingham, Milton Keynes, Wolverhampton, Bromsgrove, West Midlands, Malvern Hills, Wychavon, Worcestershire, Bracknell Forest, Canterbury, Buckinghamshire, Chiltern, Bournemouth, Castle Point, Bedfordshire, Fenland, Cambridge, Cambridgeshire, Bolsover, Craven, Leeds, Bradford, Blackburn, Halifax, Wakefield, Derby, Lichfield, Cotswold, Erewash, Doncaster, Hull, Bristol, Calderdale, Charnwood, Chesterfield, Derbyshire, Cherwell, Oxfordshire, Dartford, Gravesham, Maidstone, Sevenoaks, Swale, Thanet, Tonbridge, Malling, Kent, Hammersmith, Fulham, Greater London, Elmbridge, Epsom, Ewell, Mole Valley, Reigate and Banstead, Tandridge, Waverley, Surrey, Medway, Kent, Swindon, Ipswich, Rochford, Ha stings, Lewes, Rother, Wealden, East Sussex, West Sussex, Horsham, Chichester, Test Valley, Southampton, Southend on Sea, Tunbridge Wells, Worthing, Kennet, Salisbury, Winchester, Wiltshire, Adur, Ashford, Aylesbury Vale, Babergh, Huntingdonshire, Blaby, Coventry, Harborough, Hinckley, Bosworth, Melton, Oadby, Wigston, Rutland, Wycombe, Leicestershire, Lincoln, Lincolnshire, Corby, Daventry, Stroud, Tewkesbury, Gloucester, Kettering, Wellingborough, West Lindsey, Northamptonshire, Bassetlaw, Broxtowe, Forest of Dean, Gedling, Mansfield, Newark, Sherwood, Rushcliffe, Nottinghamshire, Rutland, Colchester, Maldon, Tendring, Uttlesford, Essex, Exeter, Fareham, Breckland, Broadland, Eastbourne, Great Yarmouth, King's Lynn, Norwich, Norfolk, Mendip, Somerset, Forest Heath, St Edmundsbury, Waveney, Suffolk, New Forest, Caradon, Carrick, Kerrier, Cornwall, Devon, Christchurch, Dorset, Dover and Somerset, South Wales, Bridgend, Bridgnorth, Blaenau Gwent, Carmarthenshire, Torfaen, Caerphilly, Merthyr Tydfil, Swansea, Monmouthshire, Neath, Newport, Port Talbot, Glamorgan.